Bible prophecy has always been important to Seventh-Day Adventists, more so than you would find among mainline Christian groups, even Evangelicals. The SDA church was founded on Bible prophecy, and its phenomenal growth during the 20th Century was based on an emphasis on Bible prophecy. The Millerite Movement of the 1840's gave birth to the Seventh-Day Adventists. The Movement was generated by a false prophecy made by William Miller, a Baptist pastor, that Jesus would return in 1844. When this prophecy failed to materialize — an event that came to be called "The Great Disappointment" — a small group of Millerite diehards decided to rescue the prophecy by spiritualizing it. They argued that William Miller had set the right date but had prophesied the wrong event! Instead of returning to earth on the prescribed date, Jesus had instead entered the Holy of Holies in Heaven to begin a second aspect of His atoning work called "the investigative judgment." This process, which continues to this day, involves an evaluation of the sins and works of each believer to determine their eternal destiny. 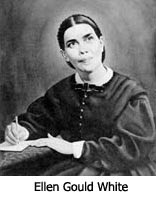 All the fundamental concepts of the SDA scheme of end time events were developed by Ellen G. White and are contained in her book, The Great Controversy (1888).2 Since she is revered by the SDA as a prophet of God, no one has dared to tinker with what she wrote. Accordingly, when you write to the SDA today requesting information about Bible prophecy, you will not receive a summary written by any modern day author. Rather, you will be sent a copy of a brief booklet entitled The Final Events of Bible Prophecy3. This booklet is nothing but a compilation of relevant chapters from The Great Controversy. Ellen White's writings are not easy going. She was a longwinded writer with a tendency to preach and chase rabbits. Her writings are thus disjointed and difficult to consolidate into a timeline of events. Fortunately, the essence of her end time concepts has been boiled down by Doug Batchelor, the SDA spokesman for the "Amazing Facts" television program. He has summarized the concepts in a video that is also named "The Final Events of Bible Prophecy. "4 To date, hundreds of thousands of copies of this very high-tech, spectacular video production have been distributed worldwide. In the next part of this series on what the Seventh-Day Adventists believe concerning the end times, we'll look at how they define those coming periods and events. 1) John Ecob, booklet entitled Seventh-Day Adventism Weighed and Found Wanting (Marayong, Australia: Herald of Hope Magazine, 2004). 2) Ellen G. White, The Great Controversy, first published in 1888. Now available from Remnant Publications in Coldwater, MI (1997). 3) E. G. White, The Final Events of Bible Prophecy, (Amazing Facts, 2004). 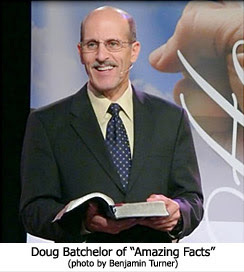 4) Doug Batchelor, "The Final Events of Bible Prophecy," a video produced by Amazing Facts Ministry, Roseville, CA (2004). Hopefully also do an expose on their surreptitious proselytising via Revelation Seminars and several websites. One of their writers has also maintained a vigorous campaign attacking the "Left Behind" eschatology. I think we can agree that the Bible is God's Word. there is nothing further that says excluding the prophecies. So therefore we must assume that Jesus meant including all of it including Bible prophecy. Why do people always Focus on Mrs. White why don't they focus on Jesus as all SDA'a do? There is not 1 SDA who whould favour Mrs. White above Jesus. As for the "great cover up." :) we are all entitled to interperate events in any way we choose yet I would hope that people walk a mile in the shoes of the thing they wish to interperate to get an accurate feel for what's actually going on. So I challenge you to become an SDA for 6 months and then to comment on Seventh Day Adventism. If after 6 months you still feel this Blog is Valid then so be it. You say no one has dared tinker with what she (Ellen White)wrote, then in the same breath you mention the booklet they send to people about their religion is a booklet compiled with parts of her book? Further you note that Doug Bachelor has actually paraphrased her long winded version?If that's not tinkering then I dont know what is. "Revere" her? This is not how you revere someone. Dear Sir, I will pray for you. I don't understand what you are talking about. Please hurry and tell more. It is very confusing. What are the anonymous people talking about? This is giving me great anxiety. What are you trying to tell us? God Bless! "we are all entitled to interperate events in any way we choose...."
Am I to take it that you saying someone should become an aethist, satanist, Mormon, Muslim, buddhist, or whatever for 6 months before forming an opinon? Questions about SDA beliefs, or are an SDA with a question? Check out this article. The most dangerous heresies are those who, at first or second glance, appear to be nearly right. A ten foot bargepole - with S.D.A -I would not touch! No time for more other than to say it is good, right and Biblical to warn Christ's Body of those who have faulty teaching couched in 'christian' terminology. Thank you Lamb and Lion for sounding the alarm so clearly.